Your priority as a trader is to position yourself in a way that enable you to survive long enough in the market and Learn How To Trade. Next try to make a consistent profit years after years and finally, to make spectacular gains! Most of the beginner get the priorities wrong. They start by aiming for spectacular gain in the short term and never think about long term survival. Eventually a large number of beginners position themselves in a way that mathematically guarantee their failure and end up being wash out of the market every year. One of the ways to ensure your long term survival is to “Cut Your Losses Short”! Why do you think limiting losses is such an important strategy for traders? This is because no matter what percentage of capital you lose, you need to make a higher percentage just to get even. Let say you start trading with a $10,000 capital. If you loss 20% on a trade (ie your trading account drop till $8,000), you will need to make a 25% profit on the reminder capital ($2,000/$8,000) to come back to breakeven. If you loss 50% of your initial capital, you will need to make a 100% profit from the remaining capital so that you can restore back to the initial capital ($5,000/$5,000). 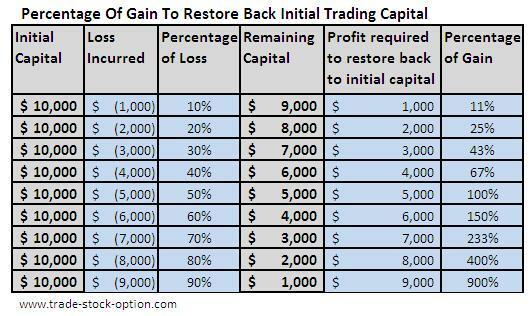 Below is a chart showing the different percentages of loss and how much gain (in term of percentages) is required to restore back to the initial capital. From the above, you can see that to make up for any loss taken from the stock market, you will need to make a higher percentage of gain then the loss incurred. How likely is a trader who has loss 50% of his capital able to earn 100% back to breakeven?? It all depends on how much you had learned from the experience. The above money management tips is an important concept. Remember, if there is No proper money management, no matter how much capital you have in your trading account, it can also be wipe off in a single losing trade or a series of “small losses” and endanger your long term survival. Next look at how limiting losses through Money Management Strategies will enhance your survival in the world of trading.